Two of the four brothers and a native doctor, who allegedly killed their grandmother for money ritual in Ohovbe quarters, Ikpoba Hill, Benin, have been arrested by operatives of the Edo State Police Command. Four brothers, who are internet fraudsters, reportedly consulted the native doctor on how to get rich and were told to kill someone very close to them. It was gathered that the suspects, arrested weekend, reportedly committed the offense last December and have since been on the wanted list of the Police. It was also gathered that three of the suspects, including the two brothers, Dickson and Salaya, and the native doctor, confessed to killing their grandmother, Grace Oviedo, for money ritual. A family source said the native doctor instructed them to tie a live tortoise to their back and kill someone very close to them. Then they would become very rich. The four brothers, on getting home, strapped a tortoise to the back of one of them and together they smashed their grandmother’s head against a wall. They were sighted while attempting to dispose of the body but were able to escape. 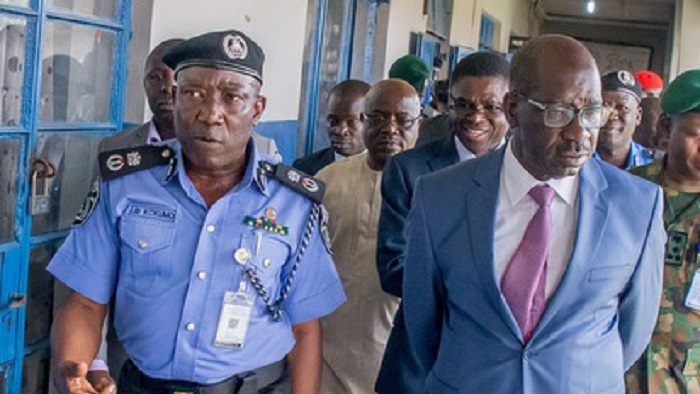 Edo Police spokesman, DSP Chidi Nwanbuzor, who confirmed the incident, said Dickson and Salaya have been arrested, while the two others are on the run. Suspected Thief Who Makes His Snake Swallow His Loots, Caught In Benin, Edo State.